The general server Client Configuration can be overwritten per database. This option needs to be checked in order to be able to override the existing requests configuration. If not checked, then the existing general server requests configuration will be used. 2. Check these options to actually override the existing general server requests configuration. If not checked, when the above 'override' is turned on, then the Effective Configuration will be: 'Client Default'. 3. Set the specific read-balance method and the max requests number value desired for this database. For a detailed explanation about each field see: server requests configuration & Load Balance & Failover. 4. This is the existing general server requests configuration. 5. This is the Effective Configuration that will actually be used. This view will be as in the above image when a general configuration is defined. 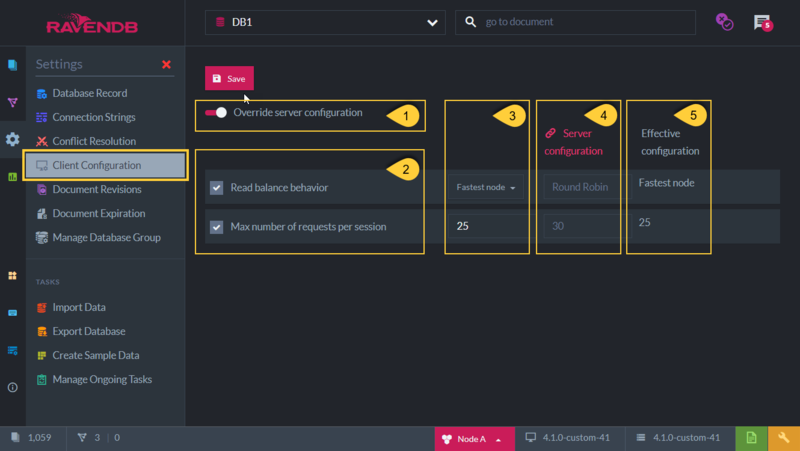 If a general configuration is not yet defined then this view will be similar to the general server configuration view.